Create your own #WearOrange image, and share it on Facebook or Twitter to show everyone why you’re committed to ending gun violence in America. Please share this copyright-free image. You, too, may play with colors at Everytown’s website, here. There, you can join the so-called “thousands of Americans” who allegedly wore orange on June 2nd & 3rd to send a powerful message. Together, we can change the world by cluttering the internet with orange-tinted images. 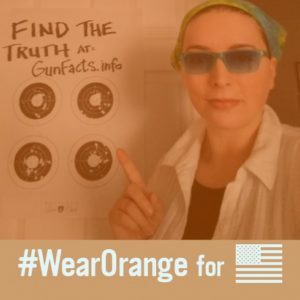 This entry was posted in Uncategorized and tagged Everytown, Moms Demand, Wear Orange by Stephanie. Bookmark the permalink.